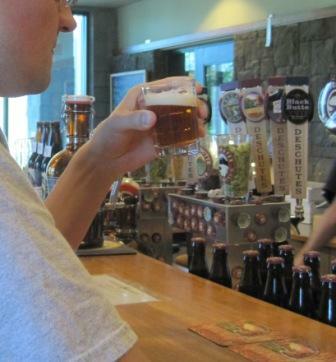 During my recent trip to the Deschutes Brewery, I had the chance to try a number of great beers. Top of the list was Black Butte XXII, an imperial stout brewed in a limited release batch commemorating the brewery’s 22nd anniversary. Because you can’t get a lot of these beers elsewhere, I thought it might be of interest to Aleheads exactly what Deschutes is serving currently at their brewpub. This list comes from the Bend brewpub, and is from Aug 6th. The only changes were the addition of a cask conditioned Mirror Pond Pale Ale, and a cask conditioned scotch ale (the name of which escapes me). This list is reproduced word for word from the list I got at the pub, so they’re Deschutes’ descriptions, not mine. For the record, the Core Brands are more readily available. The other sections represent more experimental beers, and might give us some insight into the future of Deschutes beers. Let’s hear what you think — has anyone had any of these? So there they are, the beers currently on tap at the Deschutes brewpub. Sad to say there’s no place like this where I live on the East Coast! I didn’t have a single bad beer during my entire trip out West, and Deschutes was a big part of that. Posted in Ale Factories, Alehouses, Beer Culture. Wow, what a fun list. I’m curious about the Belgian inspired offerings (Tropisch Bruin and Belgian IPA). Are we going to get tasting notes for some of these beers? Unfortunately, not from me. I had a cask conditioned mirror pond pale ale and a scotch ale, but after that we had to go. Most of the tasting I did was in the tap room at the brewery and other than the XXII I had their generic beers (which still top most stuff you can get out here…). Maybe Beerford can find some of them and do some guest tasting notes? I was able to sneak home a bomber of the Black butte porter and hop-in-the-dark, both of which i’ll write up tasting notes for when I drink them in the next week or two.